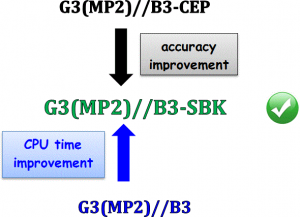 The method referred to as G3(MP2)//B3-SBK corresponds to an upgrade of the combination of the G3(MP2)//B3 theory with a compact effective pseudopotential (CEP), originally referred to as G3(MP2)//B3-CEP. The main modifications are related to: a) the replacement of Pople style basis functions by the respective 31G basis sets developed by Stevens, Basch and Krauss, b) re-optimization of the CEP-G3MP2large basis set with respect to some experimental data, c) re-optimization of the higher level correction (HLC) parameters, d) the use of scaled experimental atomization energies of the elements and e) the inclusion of conditions for the calculation of thermochemical properties considering molecules containing Sn and Sb. Evaluations were carried out with properties belonging to the G3/05 training set, i.e. enthalpies of formation, ionization energies, electron affinities, molecular atomization energies and proton affinities. The best combination of adjustments yielded a mean absolute error for all tested properties of 1.43 kcal mol−1. This deviation is essentially equal to that presented by the all-electron G3(MP2)//B3 theory. The inclusion of 40 new molecules containing silicon (3 molecules), germanium (1 molecule), arsenic (4 molecules), tin (26 molecules), and antimony (6 molecules) to the G3/05 training set increased the mean absolute error for all calculated properties to 2.15 kcal mol−1 using the conventional procedure and 1.86 kcal mol−1 by including a scaling of the experimental atomization energies of the elements. Reference experimental properties with lower errors will provide better results for compounds containing Sn and Sb.